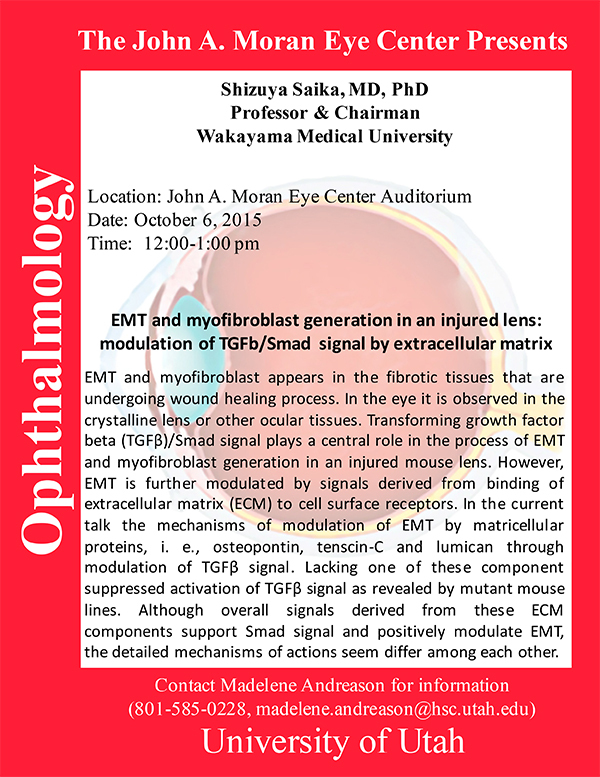 Shizuya Saika, Professor and Chairman of Wakayama Medical University will be delivering a seminar on EMT and myofibroblast generation in an injured lens: modulation of TGFb/Smad signal by extracellular matrix on Tuesday, October 6th at Noon in the the Moran Eye Center auditorium. Abstract: EMT and myofibroblast appears in the fibrotic tissues that are undergoing wound healing process. In the eye it is observed in the crystalline lens or other ocular tissues. Transforming growth factor beta (TGFβ)/Smad signal plays a central role in the process of EMT and myofibroblast generation in an injured mouse lens. However, EMT is further modulated by signals derived from binding of extracellular matrix (ECM) to cell surface receptors. In the current talk the mechanisms of modulation of EMT by matricellular proteins, i. e., osteopontin, tenscin-C and lumican through modulation of TGFβ signal. Lacking one of these component suppressed activation of TGFβ signal as revealed by mutant mouse lines. Although overall signals derived from these ECM components support Smad signal and positively modulate EMT, the detailed mechanisms of actions seem differ among each other.